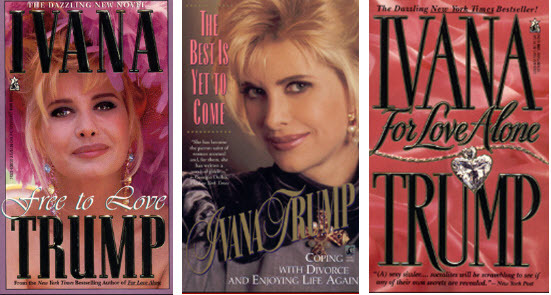 Ivana Trump will publish a new book called Raising Trump. The announcement was made by her publisher, Gallery Books, an imprint of Simon & Schuster. This will be Ivana's fourth book. Her past books include Free to Love, The Best is Yet to Come and For Love Alone. Ivana's former husband Donald Trump is now the 45th President of the United States. She raised their three children - Donald Jr., Eric and Ivanka. Simon & Schuster says Ivana will talk about her "extraordinary life and the raising of her three children" in the new memoir. Ivana says in a statement, "Every day, people ask me how I raised such great kids. They are truly amazed when I tell them that there was no magic to their upbringing. I was a tough and loving mother who taught them the value of a dollar, not to lie, cheat or steal, respect for others, and other life lessons that I'll share now in Raising Trump, along with unfiltered personal stories about Don, Eric, and Ivanka from their early childhood to becoming the 'first sons and daughter.'" Vanity Fair hopes the book will be full of salacious details. Gallery Books says in a release that it will be non-partisan and non-political. The publisher says it will be devoted to the raising of her children but will also discuss her escape from communist Czechoslavakia and her "whirlwind romance." The book is slated to be released on September 12, 2017. It will be edited by Nina Cordes. Cover art has not yet been released.